We're breaking out of our normal routine around here to bring you a month filled with joy. Marcy and I have been keeping our eyes and ears open to show you some things that simply bring a smile to our faces! Whether it be an educational craft, a gift to give, a classroom project, or even a holiday tradition that we think might bring you happiness too. 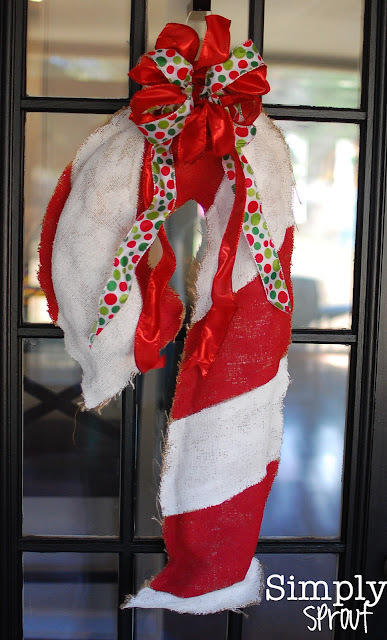 Today's joy comes in the form of a candy cane burlap door hanger that happens to be super simple to make. Children can definitely help with this Christmas creation! I know we haven't flipped the calendar over to December yet, but it's never to early to start thinking about teacher or volunteer gifts. Trace a candy cane on your burlap (notice I chosen a seasonal shape that even I can't mess up!). Fold your burlap so that you can cut once and have two candy canes. If you are able to find red burlap, you will just need to paint white stripes. If you use natural, like I did, you will need to paint both red and white. The burlap soaks up your paint so you will use a couple of bottles of each color. This is the longest part of the project, so don't give up! Make sure to paint on a piece of cardboard. The paint will soak through the burlap. You only need to paint the front side of the candy cane. Once you have the front of your candy cane painted and dried, either sew the two pieces together or hot glue at the edges. Make sure that you leave an opening to stuff the shape! Now gather your bag of plastic grocery sacks and start stuffing. This plastic stuffing allows the cane to hold its shape and be more weather resistant. Stuff until you can stuff no more! Then sew or glue your candy cane shut. Add some florist wire to the back to make it able to hang, and a big ole fluffy bow. If you aren't the best at making your own bow, have the ladies at your craft store whip one up for you. Perfectly festive, inexpensive, and simple gift to give or keep for yourself! If you have something that brings you joy and you would like to share with us, please email us at simplysprout@gmail.com.